Subject description: "Intensifying Light Trajectory"
An early champion of laser technology in the Allied Forces, this general has developed comprehensive offensive and defensive strategies all around laser-based weapons. It is only in recent years that powerful lasers became cheap enough and light enough to mount on battlefield weapons and deployed them throughout his forces. He has the most devastating laser weapon systems, in this general's point of view, everything is accurate and the word "miss" is obsolete in his vocabulary. Upgrading the Prism technology gives this general superiority in med-long range assaults. His laser weapons and his ever reluctant use of the technology named him 'The Crimson of Prisms'. - Grand Cannon can now fire a high velocity shell that will hit the target in a pinpoint accuracy. - Shells now do not have AoE. - fires a high-energy laser to an Allied space reflection satellites, which then directs and storms an area of laser beams. - Armed with charged laser cannon which fires a constant laser beam with pinpoint accuracy onto its target and does damage over time. 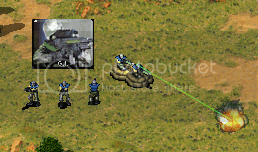 - Improved tank armor, lasers do more damage against tanks, more spreadshots when attacking. Maybe you should make them "energy weapon general" or something similar instead so not every weapon is some kind of laser. Most weapons simply being insta-hit lasers is, well, lazy and not very interesting. 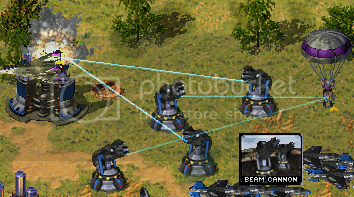 Plus it really doesn't make sense that the lasers have different effects on different amour types when they look almost identical (such as Grizzly, Tank Destroyer, Prism Tank, they all have the same laser weaponry and yet effect targets differently for no reason). This general is really having an almost insta-hit weapons, I'm ditching out every AoE weapons. Since its lasers, most of the new laser weapons may not affect some structures or vehicles. 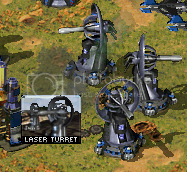 And there are types of lasers as well depending on the type of surface it will hit. Prism Tank's weapon have spreadshots but it has little damage on heavy vehicles. But good on buildings. Making Units in VXLSE is pretty easy but it does get boring when making huge units. oooh that's nice but I know that there are two colors in each VXL. For example the first color is yellow how can I make the second color vary? Sorry to confuse. Actually, what I meant is how can I make the second color depend on the color that you will choose from a certain house? Bottom Red Set is the House Colors which are changed depending on which color your using in the game. 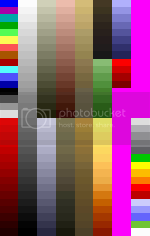 All the Colors except the top-left column shouldn't be used most often. People use the Cyan there for the "Power Glow" often though. Grayscale up to the Blue & Non-House Color Red are used most often for voxels. Bottom Left Corner with the Red are the House Colors used to provide Remap. Top Third Column = "Soviet Brown"
Bottom Third Column = "Allied Blue"
Bottom Fourth Column = "Yuri Brown"
Bottom Fifth Column = "GDI Gold"
Umm. Could you encircle what to use and what you're trying to say? No offense but I can't just keep up.